Islamabad: The United States on Thursday condemned the attack in Pulwama district of Jammu and Kashmir and asked Pakistan to deny safe havens to terrorists, PTI reported. The White House urged Pakistan to “end immediately the support and safe haven provided to all terrorist groups operating on its soil, whose only goal is to sow chaos, violence, and terror in the region”. In a statement, White House Press Secretary Sarah Sanders said the attack “only strengthens our resolve to bolster counterterrorism cooperation and coordination between the United States and India”. At least 37 Central Reserve Police Force personnel were killed after a militant drove an explosive-laden vehicle into a bus. The Jaish-e-Mohammed militant outfit claimed responsibility for the attack. 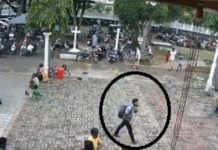 A senior police officer in Kashmir confirmed that there was an input about possible IED attacks but said it was not specific. Earlier, the US State Department said it is committed to working with India to combat terrorism. “The US condemns in the strongest terms the terrorist attack today on an Indian CRPF convoy in the Indian state of Jammu and Kashmir,” State Department Deputy Spokesperson Robert Palladino said. He offered condolences to the families of the deceased. “The United Nations-designated, Pakistan-based terrorist group Jaish-e-Muhammad has claimed responsibility for this heinous act,” Palladino said. He said all countries must follow their responsibilities under regulations set by the United Nations and not provide shelter to terrorists. United Nations Secretary General Antonio Guterres strongly condemned the attack, PTI reported. His spokesperson Stephane Dujarric said those involved in the attack should face justice. However, about India’s bid to get Jaish-e-Mohammed designated as a terrorist organisation, Dujarric said the matter is in the hands of the UN Security Council. 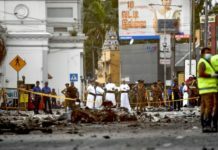 Leaders and representatives of several other countries, including France, Russia, Sri Lanka, Nepal, Bhutan, Maldives, Thailand, Germany, Canada and Australia condemned the attack and expressed solidarity with India.